So you want to remodel your bathroom. That’s pretty exciting! But now comes the hard part – the reality of facing your budget. It helps to have an idea of the average cost of a bathroom remodel, but depending upon the decisions you make, the cost can be even more than you expected. And you will not recoup the full cost of a bathroom remodel when you sell your home. You can expect anywhere from a 50-70% return on your investment. I believe in having two numbers when it comes to creating any kind of home improvement or remodeling budget. The first number is your ideal, total, all-in cost. The number that would make you happy and comfortable to not exceed. The second number is your contingency. An additional amount of money you can afford to spend but prefer not to if you can avoid it. If you have done some research and you are sure your numbers are based somewhat in the real world, you should set those budget numbers before making any other decisions regarding your bathroom remodel. You don’t want to fall in love with a wi-fi smart toilet before knowing what your budget is. You could end up being stuck with a remodel that only consists of the toilet replacement. And by the way, I really hope that a Wi-Fi toilet is not a real thing, but I wouldn’t be surprised if it is. Ok, so I Googled it. It is a real thing. I think my faith in humanity dropped a few levels just now. Anyhow, back to the average bathroom remodel cost. When it comes to creating your budget for a renovation project, you need to know that the costs can change depending on the size of the room. Small bathrooms will be more affordable than a large master bathroom. But maybe not significantly more. If you need a separate shower stall and bathtub, that will require a larger budget than a bathroom that only needs a shower or tub/shower combo. Or if you want a lot of cabinetry in the larger bathroom. If the only extra expense is additional flooring and paint, your budget may not increase that much. According to HomeAdvisor, the national average in the United States for a bathroom remodel is a little over $10,000, $6,500 for a small bathroom. They also report that the typical range is around $6,000-$15,000 but can be done as low as $1,500 and as high as $25,000. That’s a huge range, so choose a target within that range where you feel comfortable with your ideal budget number, and then choose a contingency amount so you know your maximum budget number. But use these numbers cautiously, and don’t let them deter you from your project. My nautical bathroom remodel is budgeted at around $1,200. It’s a small bathroom and doesn’t need to be fully gutted. I also chose some higher end products. My goal is to get that down below $1,000 when all is said and done. But my contingency is $300 because I decided that $1,500 is my max for that room. Not enough for a smart toilet but enough to upgrade something should I fall in love with a particular item as I plan the remodel.But my budget doesn’t include labor, we will be doing the work ourselves. HomeAdvisor estimates figuring $70 per s.f. for a DIY bathroom remodel with average or low end fixtures and up to $250 per s.f. for a high end remodel installed by a licensed general contractor. A contractor will have markup that brings the total cost to around 1.5 times the material costs for remodeling projects. This includes their overhead, labor expenses, permits and a slim profit margin. Some recommendations say that a remodeling contractor should only charge 10%-20% of the project cost. On a high end $25,000 bathroom remodel, that is equal to $5,000. $5,000 to pay their overhead (insurance, taxes, etc. ), pay employees, pull permits, etc.. That will leave little room for profit, and may even cause them to lose money. 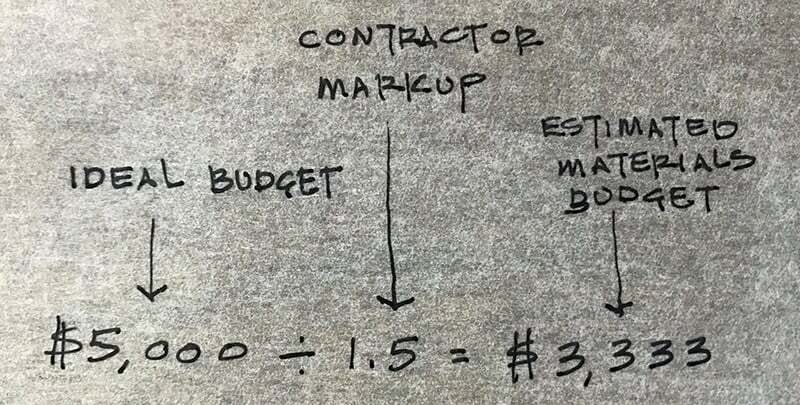 A markup of 1.5 is 50% of the project cost. When choosing a contractor, you don’t want one that has not added enough profit into his price. You risk a job where they cut corners to recoup their losses. You may end up spending more in the long run and be very disappointed with the outcome if you choose a contractor who underbids the job. Contractor bids will also likely not include unforeseen conditions like plumbing and electrical issues that can’t be predicted until they begin the project. So your bathroom remodel will cost anywhere from $1,500 to $25,000. Clear as mud right? Well, that’s where your real world budget comes in. If you only have $500 to spend, you can design a remodel around that number. 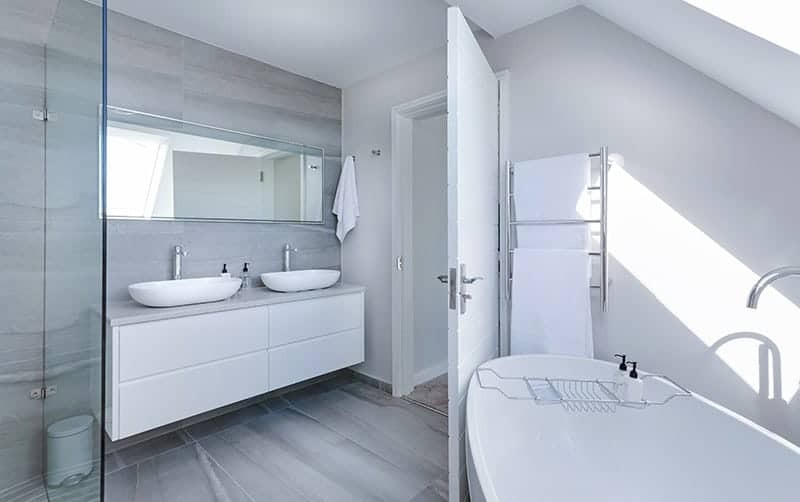 You will just need to take careful inventory of your bathroom and decide what can stay, what must be replaced, or what just needs some repair or a little bit of elbow grease to make it look like new again. Our bathroom remodel checklist can help you organize all of this information. So right now, decide on your ideal budget. Write it down. Commit to it. This is the number that leaves you happy and satisfied that you got the bathroom you wanted without spending too much. Next decide on your max budget so you know how much wiggle room you have. Write this number down too. This number is the ceiling. The max number that you are willing to spend. The number that would upset you to exceed. The difference between the max budget and the ideal budget is your contingency budget. This budget might be used for unforeseen issues, or to upgrade something that you decided was necessary to include in your design. If you are planning on doing the work yourself, you have your entire budget to work with to complete the project. If you are hiring a contractor, you will need to do a little bit of math. Take each budget number (your ideal and your max) and divide it by 1.5. This number is an approximation of your materials budget. Finally, print out and work through the bathroom remodel checklist mentioned above so you have a plan for what can remain if your budget doesn’t allow you to replace everything. This checklist is an inventory of what you have, and the condition of it. It also gives you room to put estimated costs to help you in your budget planning. Now that you have your budget numbers, you can begin to more closely estimate how much your actual design will cost. Will you be doing the work yourself or hiring a contractor? If hiring a contractor, you will need to factor in labor costs in addition to materials cost. You might be able to save money by doing some of the work yourself and hiring a contractor for the more complicated things. Are you simply replacing fixtures and flooring and painting the walls or do you need to strip it down to the studs and start over? Or something in between? Are you replacing lighting fixtures, electrical outlets, exhaust fans, etc.? Do you have to replace any plumbing and electrical wiring that is behind the walls? What about flooring? Install costs for certain types of flooring cost more than others. A ceramic tile floor requires more labor than sheet vinyl or even vinyl plank flooring. Are you replacing plumbing fixtures (sink, shower, tub, toilet, etc.) and accessories (faucets & shower head)? Leaving the fixtures but upgrading the accessories? Don’t forget things like towel bars and toilet paper holders. Are you replacing the trim at the base of the walls? What about the door, windows or the trim around the doors and windows? Where are you located? The average price of things may vary depending upon your geographic location. Don’t forget decor items. Shelving, pictures, tissue dispensers and so on. Value. Value is last but probably one of the most important things to consider. If you have a home valued at $150,000, spending $25,000 on a bathroom remodel is probably not going to end up recouping as much as a $5,000 remodel. You have to match the quality of the remodel to the value of your home. Unless, of course, you don’t even plan on moving. 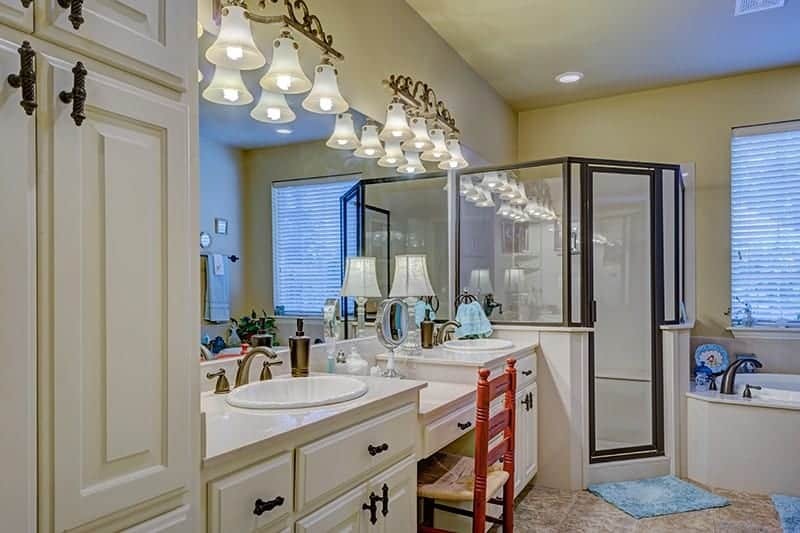 If you live in your dream home and have the budget to create a dream bathroom, then go for it. Just don’t expect as high a return on your investment because the cost outweighs the overall value for your home. Tailor your bathroom remodel to your neighborhood and home value range. Research your neighborhood by talking to neighbors, a realtor, or looking at websites like Zillow or Realtor. Try to get a feel for the level of finishes that are typical for your home’s price range and neighborhood, and make sure your new bathroom will fall within that range. For example, if your house is in a sheet vinyl floor/plastic laminate countertop neighborhood, you probably don’t want to install a high end marble bathroom. You’ll never recoup your money. Conversely, going with budget materials in an upscale neighborhood is not a good idea either; future buyers will be expecting a higher quality that you don’t have. If you need some design ideas, home and remodeling magazines might be a good place to start. Pinterest is also a great place to curate ideas for your bathroom remodel. It helps to have a feel for the style you are trying to achieve. At this point you can do it all with online research on the websites of stores like Home Depot or Lowes. Find the styles you like, note the prices and add them up and see where the total falls within your budget. If you are hiring a contractor, you can still use this exercise to help the contractor understand your design tastes, and in some cases they may be able to get better pricing on a similar item if they are able to buy at wholesale. So you may end up slightly under your budget which always a plus. 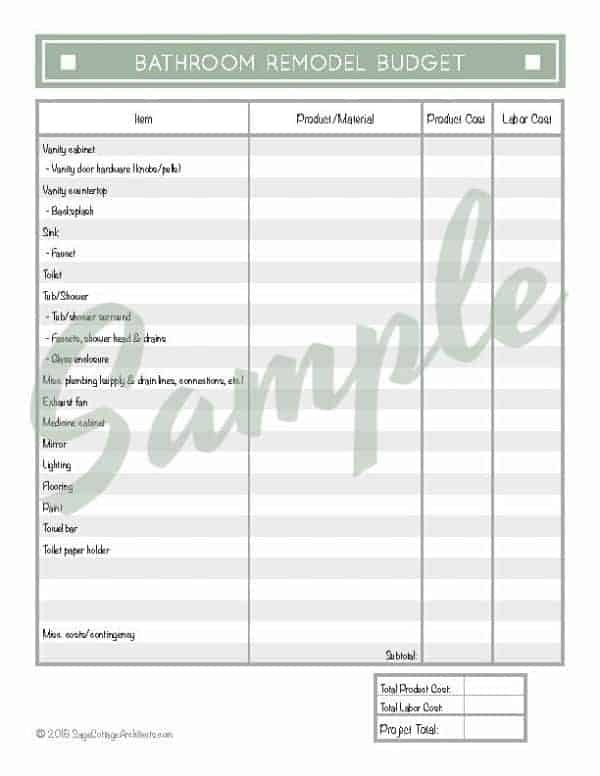 You can use our bathroom remodel budget worksheet (you can grab this below) for the budgeting process. You may find that you benefit from doing a couple of different versions including products at different price points, especially if you come in over or under budget. In general, your contingency budget should be enough to account for any unforeseen costs. But if you have an older home, you may want to prepare for a larger contingency or reduce your ideal budget somewhat “just in case”. Unforeseen costs often result from damage that can’t be seen until you remove or demo the items in your bathroom. There could be water damage. Old plumbing that needs to be replaced (lead pipes, hard water deposits in supply piping, etc.). Wiring that isn’t up to code. A crack in the back of the toilet you didn’t see. Corroded or broken toilet flange. Other hidden damage or issues. When it comes to a remodel, if you do uncover anything that is damaged, was done wrong or is not up to code, you really want to make sure it is done correctly for the remodel. This could result in hundreds, if not thousands of dollars in unforeseen expenses so you want to be prepared. When it comes to saving money, a little bit here and there can add up to a lot! Shop discount / overstock contractor supply stores. There are a lot of them out there and you can find some great deals on fixtures and flooring and everything in between. Think outside the box. Instead of buying expensive towel bars, maybe you find something to upcycle into a fun project. Avoid the trends. Trends tend to cost more and put you in a situation where your bathroom may look dated in a couple of years. Use decor items to give the room the feel you want, keeping finishes and fixtures (that are harder and more expensive to replace) more neutral. 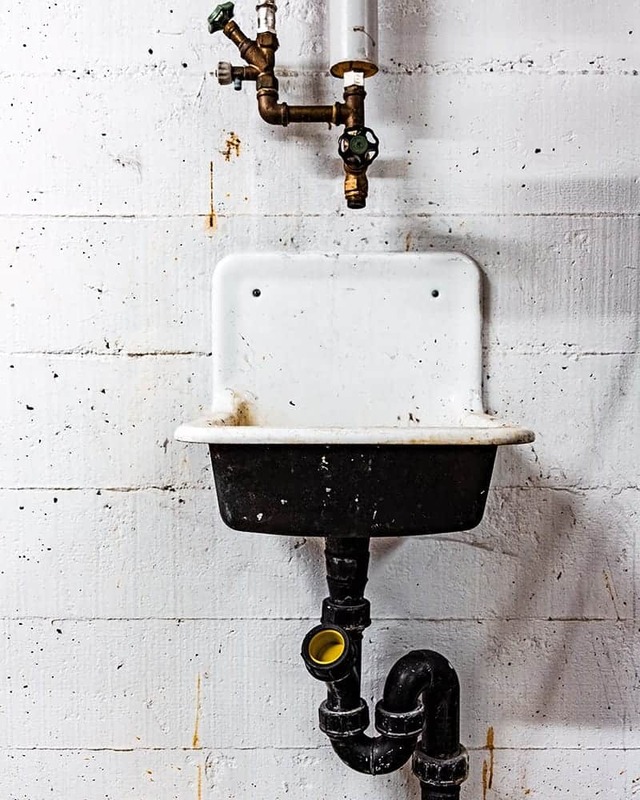 Keep plumbing fixtures in the same location. Once you start moving things around, you’re going to have to move the supply and drain lines, which will involve tearing up the floor and walls, and costs will jump exponentially (or at least it will feel that way). Rather than completely gutting the bathroom, consider keeping as much as possible. Use our bathroom remodel checklist to decide what to keep and what needs to be replaced. Obviously, if something is broken, it needs to be replaced. If it works just fine, but is out of style, can you update it or just live with it being out of style? Or, is it worth the money to replace? In many cases a repair will cost less than replacing something. For example, if you need a new tub, maybe you can refinish the tub instead of replacing it. Consider doing the work yourself. But only if you are going to do it right – pay attention to details, install everything to code, use quality materials, and take your time. A poorly done DIY bathroom remodel is worse than a bathroom that needs to be remodeled. However, a DIY project can save you around $1,600 on a $5,000 all-in budget. Combine DIY work with hiring professionals- you don’t have to do ALL the work yourself! Hire a professional to do the plumbing, while you handle the painting and replace the lighting fixtures. Chose an economical countertop. Plastic laminate can be a fraction of the cost of quartz or granite, and some of them really look like their more expensive counterparts. A solid surface countertop with integral sink is a good choice as well. Finally, cultured marble is nice option. This one’s pretty obvious, but I’m going to include it. Tackle a bathroom remodel like you would any other major purchase – comparison shop, buy the best you can afford, look for economical options, and buy materials when they are on sale. You don’t have to buy all the materials at once, or all at one store. Keep Amazon in mind – did you know you can buy this American Standard toilet and get free shipping? The UPS man won’t be too happy with you, but it’s definitely an option. Remember to fill out the bathroom remodel checklist before tackling the actual budget. You may want to print multiple copies of both so you can work back and forth to find the ideal design plan and budget that works for you. 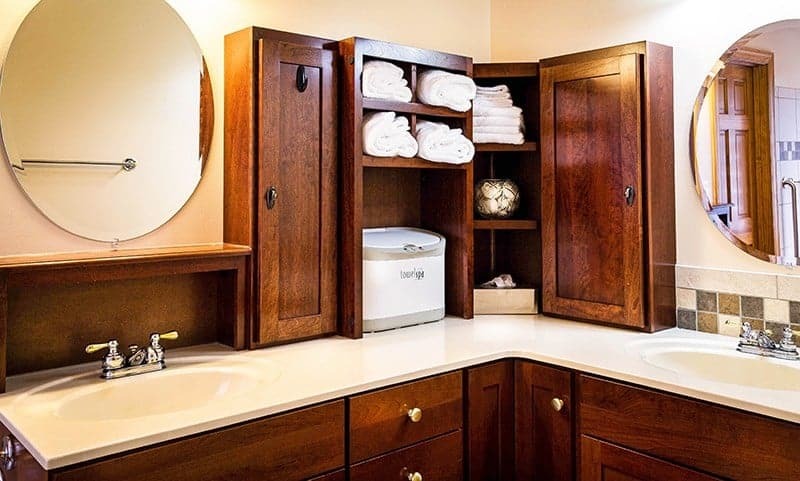 No matter what your budget, the age of your home, or who does the work for you, a bathroom remodel can be a challenge but it will be totally worth it once you see the beautiful results! And take a minute to Pin this on Pinterest so you don’t have to come searching for it later when you want to print this on your desktop computer.